In the desperate need for rays of sunshine, I’ve decided to prep my winter-dry skin with the most moisturizing skincare products out there to get it nice and soft for the Spring season. I actually started this mission ca. 2 weeks ago, when I thought it was actually going to be Spring because I thought I could finally wear some dresses ? (quick update: still no sight of Spring). I do this every year because I think that having soft and beautiful skin can really be recognized, not to mention that you feel much more confident in your own skin (you see what I did there? hehe). Now that Spring is coming closer, we’ll all show a little bit more skin, so why not put some extra effort in? Alright, now obviously, I’m no dermatologist that knows everything about skin types but I did some research for my own type of skin and came up with these products for my Spring Beauty Favorites to share with you. Let’s start out with the moisturizers by Clinique. I’ve always liked Cliniques skincare products (not so much their makeup stuff though) just because it always felt good on my skin. So I decided to come back to them and try out their repair moisturizers. Fun fact: I browsed through their products on the lookout for something and came across these two cremes for day and night. I read “custom-repair moisturizer” on them and thought: Okay, seems legit. Let’s try them. ? As to be expected, the cremes are very moisturizing and helped my skin retain the moisture. I do want to mention here that it does take some time to fully absorb into my skin, which is why I had to change my morning routine up a bit. What I mean is that instead of applying my makeup directly after my moisturizer, I went ahead and had breakfast instead to let it soak into my skin first for a bit before applying foundation. It’s actually funny that I went ahead and bought a daycreme with a SPF of 15, cause I by all means don’t need it in Denmark. ? But all in all, I’m happy with how both cremes made my skin feel soft and smooth, which is why I decided to put it on my Spring Beauty Favorites list. Although, they are a little bit expensive for moisturizers, but they do last long because you really don’t have to use a lot of it due to their texture. Moving on to the Lancôme Youth Activating Eye Serum. I started using this because I wanted to look fresh without having to use concealer ? And I think it’s great! It doesn’t feel heavy like a lot of other eye cremes, and my skin soaks it up very fast. I use this before applying my moisturizer and love how it cools any puffiness around the eyes. One of the other reasons why I started using this is because it has some kind of youth-effect, and you can never start too early with that am I right? Besides, I have a weird line in between my eyebrows that is developing into a wrinkle that needs to be tamed before it’s too late ? The next product I can highly recommend is the Clinique moisture surge face spray. I got this from my mom (cause she works in a drug store) and I love how I can use it during the day. I usually have it with me in my bag because I like the feeling of freshness that it gives me. I also use it when I wear a full face of makeup, I just don’t exaggerate because then all the effort was for nothing ?. In short: it’s hydrating, perfect for a fresh kick during the day and completely vegan btw. The next product on my Spring Beauty Favorites list is the makeup removal lotion from Diadermine. For those of you that don’t understand German, it says “soothing micelle lotion for dry and sensitive skin”. I got tired of how using those makeup removal wipes left my skin feeling a little irritated, so I wanted to switch it up a little and came across this product. Honestly, I can legit feel the “soothing” effect it promises when removing my makeup. It smells great and leaves a hydrating effect behind. Great product! 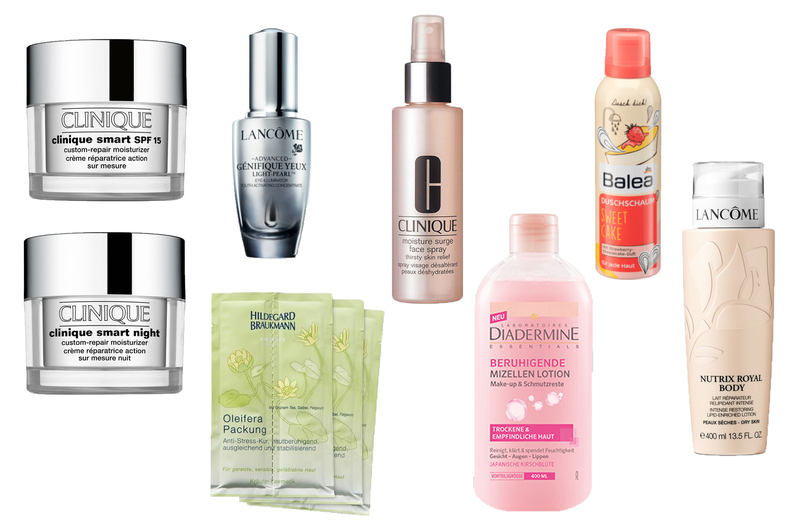 Now let’s talk about one of my favorite beauty brands on the market: Hildegard Braukmann. Her products are my all time favorites, which is also why it deserves a special place on my Spring Beauty Favorites list. The brand itself is based on herbs and made in Germany. I’ve used her products since I was a teenager and was never disappointed by what the products promised. That’s why I wanted to put this specific mask on my Spring Beauty Favorites list. It’s an anti-stress mask made of green tea, sage and pilewort, and leaves my skin relaxed and hydrated. I love it ? I also like the shower foam by Balea, the home brand of DM (drugstore from Germany). First of all, I smell like cheesecake when I get out of the shower, which is a major bonus point. ? But the reason I like this is because I don’t have to use shaving gel/foam anymore. It feels really soft on my skin, but it doesn’t moisturize it. I still wanted to put it on the list because I am just so in love with it! And the last product I want to show you guys is the Nutrix Royal Body Lotion by Lancôme. I actually got this from my work colleagues and really love it! It’s a great skin conditioning cream and made my skin recover perfectly from the winter dryness. Pro tip: I apply this after showering in the evening and put on leggings and a long-sleeve shirt to sleep in it. This “forces” your skin to absorb the moistness and you wake up with fresh and baby skin the next day! ? Alright, beauties. That was my Spring Beauty Favorites ? I didn’t include any links to the products because I think you can find them at different prices, depending on which country you’re from. So I leave that up to you ? I hope you enjoyed this post, let me know if you want me to do beauty posts more often in the comment section below or send me a private message if you’re too shy! ? Great! Thanks for sharing that! I am looking for a good moisturizer, so now I know what to try. You are very welcome 😀 <3 Thanks for the comment!